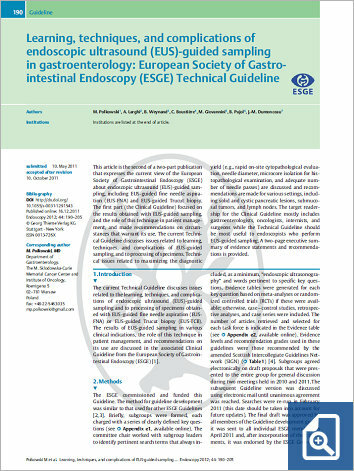 This article is the second of a two-part publication that expresses the current view of the European Society of Gastrointestinal Endoscopy (ESGE) about endoscopic ultrasound (EUS)-guided sampling, including EUS-guided fine needle aspiration (EUS-FNA) and EUS-guided Trucut biopsy. The first part (the Clinical Guideline) focused on the results obtained with EUS-guided sampling, and the role of this technique in patient management, and made recommendations on circumstances that warrant its use. The current Technical Guideline discusses issues related to learning, techniques, and complications of EUS-guided sampling, and to processing of specimens. Technical issues related to maximizing the diagnostic yield (e. g., rapid on-site cytopathological evaluation, needle diameter, microcore isolation for histopathological examination, and adequate number of needle passes) are discussed and recommendations are made for various settings, including solid and cystic pancreatic lesions, submucosal tumors, and lymph nodes. The target readership for the Clinical Guideline mostly includes gastroenterologists, oncologists, internists, and surgeons while the Technical Guideline should be most useful to endoscopists who perform EUS-guided sampling. A two-page executive summary of evidence statements and recommendations is provided.